Orange geotextiles are essential in projects where a visual warning layer is needed to prevent future excavation projects from damaging underground utilities, archaeological sites or other buried structures. The orange fabric is a prompt for workers to stop digging. Demarcation fabrics can be used to separate and add a high visibility layer between contaminated soil and new backfill on remediation sites. Orange Demarcation Geotextiles are available in woven and several grades of nonwoven to meet project needs. FX-33 Orange is a woven slit film geotextile used for visual warning barrier. As an added option, the fabric can be printed in English or Spanish with “Danger - Do Not Dig”. Please contact us for additional information about our Demarcation geotextiles. 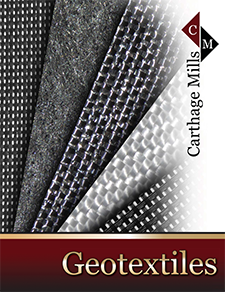 Carthage Mills' Orange Demarcation Geotextiles can be used in a multitude of applications.